It was a local dairy and a distant relative of the gi-normous Alta Dena Dairy Corporation that operates today in the City of Industry. The first Altadena Dairy, with real cows, stood on land near Lincoln and Ventura in west Altadena. 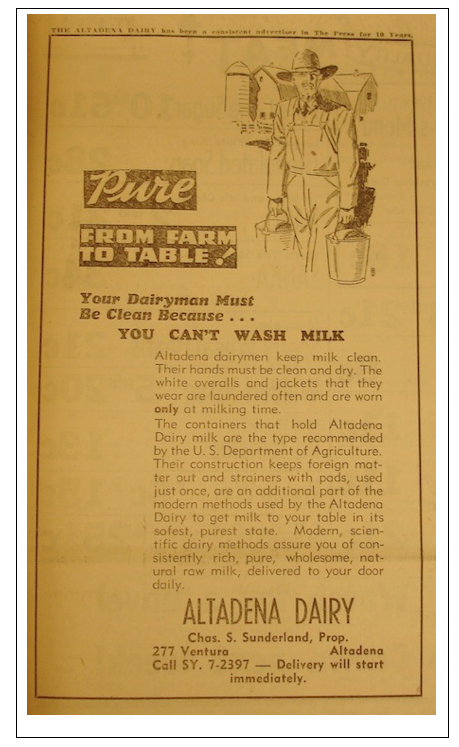 Operated by Charles Sunderland, the dairy was in business as early as the 1930s as indicated in this 1939 Altadena Press newspaper advertisement. Whether or not it’s accurate, the story we’ve been told is that the Stueve family, who had a small dairy in Monrovia, purchased Altadena Dairy in 1945. They hyphenated the name and moved it out of Altadena. The Lincoln Avenue property was sold soon after, for post-war housing. is now part of Monterrey Provision Company. The Alta-Dena Dairy drive-thrus that still dot the area were built in the 1950s by the Steuve family. Read more about their history here. Some years later, Harold Steuve became a raw milk activist, in opposition to pasteurization. After a brief arrest for contempt of court, Steuve, the mayor of Monrovia, said in an LA Times article, that he is strongly opposed to pasteurization because it causes milk to lose almost all of the enzymes. 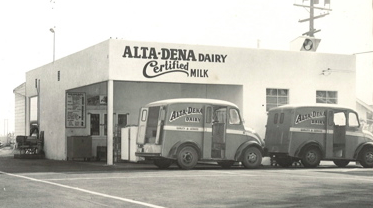 Read more about the history of the raw milk controversy and the Alta Dena Dairy in an article on the KCET website, Grab a Pint: Altadena Dairy Drive Thrus by Jessica Ritz.